Protopectinases which were consisted of various different enzymes can promote the solubilization of protopectin from the plant cell and can be applied in the protein industry extraction. The genome sequence of Paenibacillus polymyxa Z6 that produces a protopectinases complex was partially determined. Two new genes, yxiA1 and yxiA3, were identified as uncharacterized protein in the P. polymyxa genome. And, they were classified as the member of the glycoside hydrolase family 43 (GH43) according to the primary protein sequence. The two genes were cloned and expressed in Escherichia coli BL21 (DE3). And, the results indicated that the product of yxiA1 and yxiA3 were two endo-α-1,5-l-arabinanases. Thus, the two genes were renamed as abnZ2 (yxiA1) and abnZ3 (yxiA3). Recombinant AbnZ2 had optimal activity at pH 6.0 and 35°C. And, AbnZ3 had optimal activity at pH 6.0 and 30°C. However, unlike most reported endo-arabinanases, the specific activity of AbnZ3 remained 48.7% of maximum at 5°C, which meant AbnZ3 was an excellent cold-adapted enzyme. This paper demonstrated that the gene yxiA1 and yxiA3 were two new endo-arabinanases, and renamed as abnZ2 and abnZ3. Moreover AbnZ3 was an excellent cold-adapted enzyme which could be attractive in fruit juice processing. Plant biomass was an important renewable source. Both basic and applied research is increasingly required for the development of a practical enzymatic biomass degradation system. In the plant, arabinans were abundant polysaccharide, which were mainly composed of α-l-arabinofuranosyl residues, and are generally arranged in α-1,5-linked chains with varying numbers of residues substituted with other α-l-arabinofuranoside at the O-2 and/or O-3 position . Enzymes that can release arabinoses are found in various bacteria and fungi. These enzymes involved in degradation of arabinan can be mainly divided into three types by their mode of action and substrate specificity : (1) endo-1,5-α-l-arabinanases (endo-ABNs, EC 3.2.1.99), cleave internal linkages of arabinan backbone, producing arabino-oligosaccharides; (2) exo-α-l-arabinanases, cleave arabinan backbone from terminal arabinose, yielding arabinoses ; (3) and α-l- arabinofuranosidases (AFs, EC 3.2.1.55), exo-type enzyme, which hydrolyze terminal nonreducing residues from arabinose-containing polysaccharides and are active on 4-nitrophenyl-α-l-arabinofuranoside. AFs remove arabinan side chain, allowing ABNs to cleave the glycosidic bonds of the arabinan backbone. They work synergistically to generate l-arabinose from arabinan . Among the abovementioned three types of enzyme, endo-arabinanases have important application value in industry. The arabinan is soluble in water, while debranched arabinan produced by α-l-arabinofuranosidases is insoluble in cold water . In fruit and vegetable juice processing, α-l-arabinofuranosidases in the enzyme preparations cause haze formation due to the precipitation of polymeric debranched arabinans. Since linear arabinan is the best substrate for endo-1,5-α-l-arabinanases , endo-arabinanases can be applied to prevent haze formation by degrading polymeric debranched arabinan ,. In addition, as arabinan was one of the major components in plant cell wall, endo-arabinanase used in juice industry can also improve the yield of juice because they can promote the degradation of the pectin in the fruit and vegetable . Endo-arabinanases from several microorganisms have been characterized. Their optimal temperatures are 50°C for Aspergillus niger, 60°C for Bacillus subtilis and Penicillium chrysogenum, 70°C for Bacillus thermodentrificans, and 73°C for Thermotoga petrophila. Compared with the mesophilic and thermophilic endo-arabinanases, cold-active endo-arabinanases should be more attractive in juice industry as colder conditions hamper spoilage and avoid changes in nutritional properties . However, cold-active endo-arabinanases were less reported. Furthermore, in the plant primary cell wall, arabinans are concentrated on rhamnogalacturonan I regions of pectin and act as a vital neutral sugar side chain of pectin, which connects pectin to cellulose ,. Endo-arabinanases thus have potential application prospect in enzymatic pectin extraction. As a vital member of protopectinases, the endo-arabinanase can promote the solubilization of protopectin through cleaving the link between protopectin and cellulose ,. The exploring of new endo-arabinanases with different properties should expand the utilization of arabinooligosaccharides from industrial by-products in food industry. The genome sequence of P. polymyxa that produces a protopectinases complex was partially determined. Among the genome sequence, two uncharacterized proteins were encoded by two new genes (yxiA1 and yxiA3), could be classified as the member of the glycoside hydrolase family 43 (GH43), and were supposed to be arabinanases according to their primary protein sequences. Therefore, we described the cloning and expression in Escherichia coli of yxiA1 and yxiA3, which encoded two putative proteins. After purification, the catalytic activities towards different substrates were determined. The results indicated that the products of yxiA1 and yxiA3 were endo-α-1,5-l-arabinanases. Thus, the two genes were renamed as abnZ2 and abnZ3, and the biochemical properties of recombinant AbnZ2 and AbnZ3 were characterized, according to which, a cold-adapted endo-arabinanase AbnZ3 was found. Sugar beet linear 1,5-α-arabinan, sugar beet red debranched arabinan, wheat flour arabinoxylan (medium viscosity), larch arabinogalactan, arabinose, arabinobiose, arabinotriose, and arabinotetraose were obtained from Megazyme International Ireland Co., Ltd. (Wicklow, Ireland). Xylan from beechwood and 4-nitrophenyl-α-l- arabinofuranoside were purchased from Sigma-Aldrich Co., Ltd. (St. Louis, MO, USA). Gum arabic and soluble starch were obtained from Shanghai Hushi Co., Ltd. (Shanghai, China). Genomic DNA extraction kits, plasmid extraction kits, gel extraction kits and Ni-Sepharose resin were purchased from Tiangen Biotech Co., Ltd. (Beijing, China). Kod plus mutagenesis kit was from Toyobo Biotech Co., Ltd. (Shanghai, China). All other molecular cloning reagents were from Takara Biotechnology Co., Ltd. (Dalian, China). The P. polymyxa Z6 used in this study was screened from a planting soil sample collected from apple orchard in Xi'an, Shanxi province, China. And, the P. polymyxa Z6 was deposited in the China Center for Type Culture Collection (CCTCC AB 2014036). E. coli DH5α, E. coli BL21 (DE3), and plasmid pET21a (+) were used for cloning and expression of the gene yxiA1 and yxiA3. Transformants were grown in Lineweaver-Burk (LB) medium (1% peptone, 1% NaCl and 0.5% yeast extract) with 100 μg/ml ampicillin. The coding sequences of yxiA1 and yxiA3 were amplified by PCR with the primer abn-w6 and abn-w7 by using genomic DNA of Paenibacillus polymyxa Z6 as the template (Table 1). The products of PCR reaction were cloned in the plasmid pET21a (+) containing a C-terminal His-tag for purification. Bam HI and Xho I restriction sites are italicized. The recombinant plasmid was transformed into E. coli BL21 (DE3) and grown on solid LB medium containing 100 μg/ml ampicillin. Then, the positive recombinant E. coli was cultivated in 50 ml liquid LB medium at 37°C with 100 μg/ml ampicillin until the OD600 reached 0.6. After that, 0.2 mM IPTG was added to the medium to induce enzyme expression, and the culture continued to grow at 20°C for 20 h.
The target protein was purified by using Ni-Sepharose through elution with imidazole in a linear gradient from 10 to 250 mM. The concentrated active fractions were stored in 100 mM phosphate buffer (pH 7.0) containing 10% glycerol at −20°C. 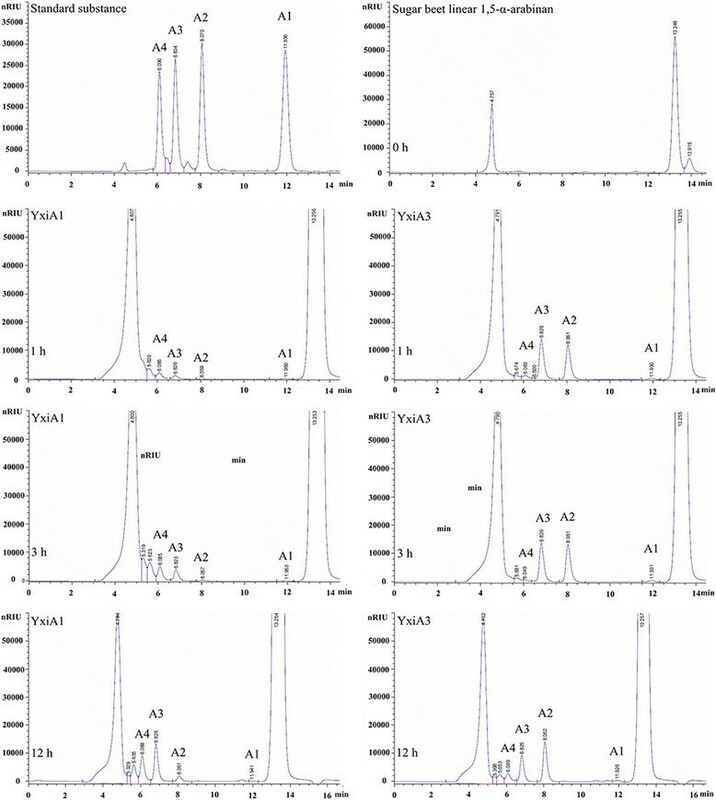 The function of recombinant proteins (YxiA1 and YxiA3) was determined by measuring the enzyme activity versus different substrates, like sugar beet linear 1,5-α-l-arabinan, sugar beet red debranched arabinan, xylan from beechwood, wheat flour arabinoxylan, larch arabinogalactan, gum arabic, soluble starch, and 4-nitrophenyl-α-l-arabinofuranoside at the pH 6.0 and 30°C for 30 min. 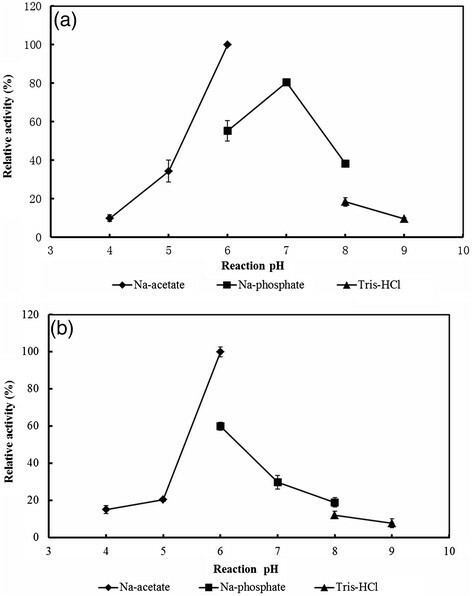 The hydrolysis products of 1% sugar beet linear 1,5-α-l-arabinan were analyzed with high-performance anion-exchange chromatography (HPAEC) using Agilent 1100 series system (Angilent, CA, USA) with a 300 × 6.5 mm Sugar-pak1 column (Waters, MA, USA) maintained at 80°C using double-distilled deionized and degassed water as mobile phase at a flow rate of 0.5 ml/min. The effluent was monitored with a differential refractive index detector. The molecular masses of the enzyme AbnZ2 (YxiA1) and AbnZ3 (YxiA3) were determined by SDS-PAGE. The protein content was determined using Bradford reagent with bovine albumin as standard. The arabinanase activity was determined by measuring the amount of reducing sugar released in a reaction mixture containing 200 μl 0.25% arabinan in 100 mM buffer and 50 μl enzyme samples. Reducing sugars were measured by using the 3,5-dinitrosalicylic acid (DNS) method . One unit of enzyme activity was defined as 1 μmol of reducing sugar as arabinose produced per minute. The optimal pH was got by measuring enzymatic activity at 37°C from pH 4.0 to 9.0 by using Na-acetate buffer (pH 4.0 to 6.0), Na-phosphate buffer (pH 6.0 to 8.0), and Tris-HCl buffer (pH 8.0 to 9.0) for 30-min reaction incubating. The enzymatic activity was measured at temperatures ranging from 5 to 70°C in 100 mM Na-acetate buffer (pH 6.0) after the reaction incubated for 30 min to optimal temperature investigation. For pH stability, the enzyme was incubated in buffers ranging from pH 5.0 to 7.0 at 20°C for various periods. 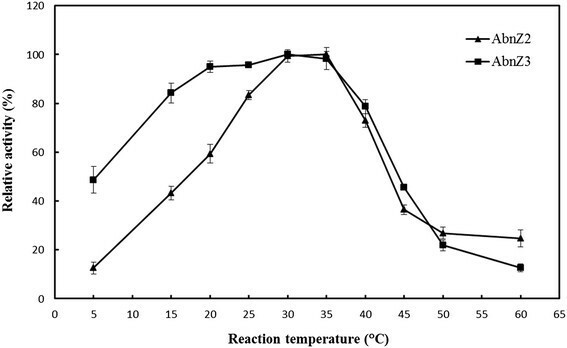 For temperature stability, the enzyme was incubated in 100 mM Na-acetate buffer (pH 6.0) at temperatures ranging from 20 to 50°C for various phases. Then, the residual enzyme activity was measured after the reaction incubated in optimal pH and temperature for 30 min. Substrate was 0.25% (w/v) debranched arabinan. The kinetic parameters were determined through the Lineweaver-Burk plot method  at the optimal pH and temperature by using the linear 1,5-α-l-arabinan at concentrations ranging from 0.1 to 1% (w/v) for 5 min. Multiple nucleotide sequence alignment of gene was calculated and presented by using the DNAMAN program. The molecular weight and pI were predicted by using the Compute pI/Mw tool on the ExPASy Bioformatics Resources Portal (http://web.expasy.org/compute_pi/). The phylogenetic tree was calculated and presented by using ClustalX and MEGA program. The nucleotide sequence data of the gene abnZ2 and abnZ3 reported in this study were submitted to Genbank under accession no. KF481914 and KF481915. The gene yxiA1 had an open reading frame of 2,436 bp encoding 812 amino acids. The molecular weight and pI of YxiA1 were predicted as 88,018 Da and 5.82, respectively. The gene yxiA3 was with an open reading frame of 1,386 bp encoding 462 amino acids. The molecular weight and pI of YxiA3 were predicted as 51,906 Da and 4.96. According to the primary protein sequence of YxiA1 and YxiA3, they were classified as the member of the glycoside hydrolase family 43 (GH43). Accordingly, specific substrates for major enzymes of GH43, like α-l-arabinofuranosidases (AFs), and endo-α-l-arabinanase (endo-ABNs), exo-α-l-arabinanases (exo-ABNs), and so on were chosen to measure the enzyme activity for identifying the function of recombinant protein. We cloned and expressed the gene yxiA1 and yxiA3 in pET21a (+) with a His6-tag at the C-terminus (Figure 1a,b). The proteins were purified by using a Ni-Sepharose column. After dilution, the final preparation of recombinant proteins was 0.04 mg/ml. Expression and purification of recombinant protein. The proteins were separated by 12.5% SDS-PAGE gels. (a) Analysis of the protein YxiA1 expression. Lane 1, crude cell lysate after cold osmotic shock of wild BL21; lane 2, crude cell lysate; lane 3, soluble fraction of the crude cell lysate; and lane 4, insoluble fraction of the crude cell lysate. (b) Analysis of the protein YxiA3 expression. Lane 1, crude cell lysate after cold osmotic shock of wild BL21; lane 2, crude cell lysate; lane 3, soluble fraction of the crude cell lysate; and lane 4, insoluble fraction of the crude cell lysate. (c) Recombinant YxiA1 purified by Ni-Sepharose column eluting with 50, 100, and 150 mM imidazole. (d) Recombinant YxiA3 purified by Ni-Sepharose column eluting with 50, 100, and 150 mM imidazole. The purified YxiA1 and YxiA3 were shown in Figure 1c,d, which indicated that the molecular weights of native proteins after purification were in good accordance with the predicted molecular weights. 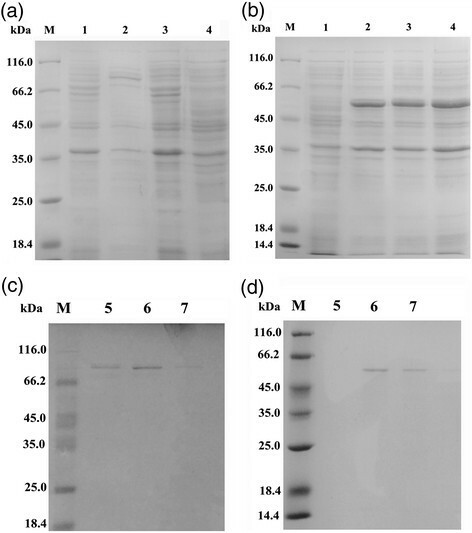 The function of purified recombinant protein YxiA1 and YxiA3 was identified by reacting with the substrate linear α-1,5-l-arabinan (substrate for endo-ABNs and exo-ABNs), red debranched arabinan (substrate special for endo-ABNs), 4-nitrophenyl-α-l-arabinofuranoside (substrate for AFs), xylan from beechwood, wheat flour arabinoxylan, larch arabinogalactan, gum arabic, and starch soluble under pH 6.0 and 30°C for 30 min. Among these substrates, YxiA1 and YxiA3 can only degrade the substrate arabinan. 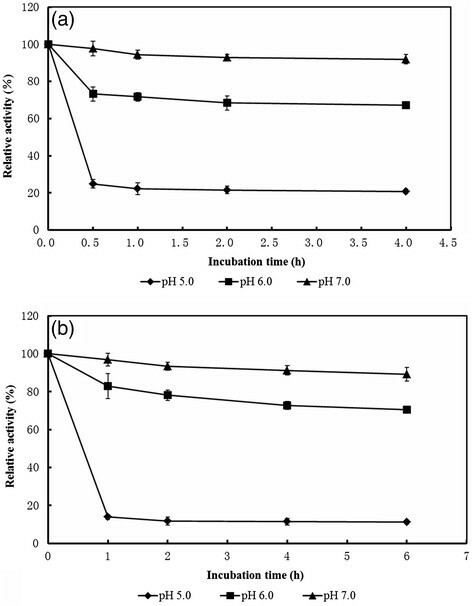 Purified YxiA1 was found to be active towards only linear arabinan and red debranched arabinan with specific activities of 18.8 and 6.5 U/mg respectively, and purified YxiA3 was found to be active on linear arabinan and red debranched arabinan with specific activities of 17.5 and 7.9 U/mg, which implied that YxiA1 and YxiA3 were arabinanases. The results of HPAEC supported that YxiA1 and YxiA3 were endo-arabinanases. Generally, in the case of exo-acting enzymes, monomers or dimers are only products accumulated throughout the enzyme reaction. While in the case of endo-acting enzymes, bigger oligomers can be formed even in the initial stage of hydrolysis (Figure 2). Besides, the ability of hydrolyzing red debranched arabinan also indicated that YxiA1 and YxiA3 act in an endo manner because dye molecules attached to non-reducing terminal arabinose of arabinan prevent the exo-arabinanases to release arabinose from the nonreducing end . Taken into account the above results, YxiA1 and YxiA3 could be defined as two novel endo-arabinanases. Thus, the two genes were renamed as abnZ2 and abnZ3. HPAEC chromatogram showing enzymatic products of linear arabinan with AbnZ2 and AbnZ3. A1, arabinose; A2, arabinobiose; A3, arabinotriose; A4, arabinotetraose. The molecular mass of AbnZ2 (YxiA1) was the biggest among all the reported arabinanases. The amino acid sequence of AbnZ3 (YxiA3) displayed 31, 37, 31, 35, 33, 32, and 35% identity with the sequences of endo-1,5-α-l-arabinanase from B. subtilis 168T+, Cellvibrio japonicus, Geobacillus stearothermophilus, A. niger, Aspergillus aculeatus, and Phanerochaete chrysosporium (Figure 3). Multiple sequence alignment of AbnZ2 (YxiA1) and AbnZ3 (YxiA3) with some GH43 endo-arabinanases. AbnZ2 (YxiA1) and AbnZ3 (YxiA3) was compared with endo-1,5-α-l-arabinanase from B. subtilis 168T+ (AAV87172 and NP391812.2), C. japonicus (CAA71485), G. stearothermophilus (B3EYM8), A. niger (P42256), A. aculeatus (Q9HFS9), and P. chrysosporium (AFN42888). The catalytic residues are marked with asterisks. Residues that are identical in all sequences are shaded in grey. The active sites of endo-arabinanases consisted of three key amino acids are Asp, Asp, and Glu. And, these three residues were conserved in glycoside hydrolase (GH) family 43 . 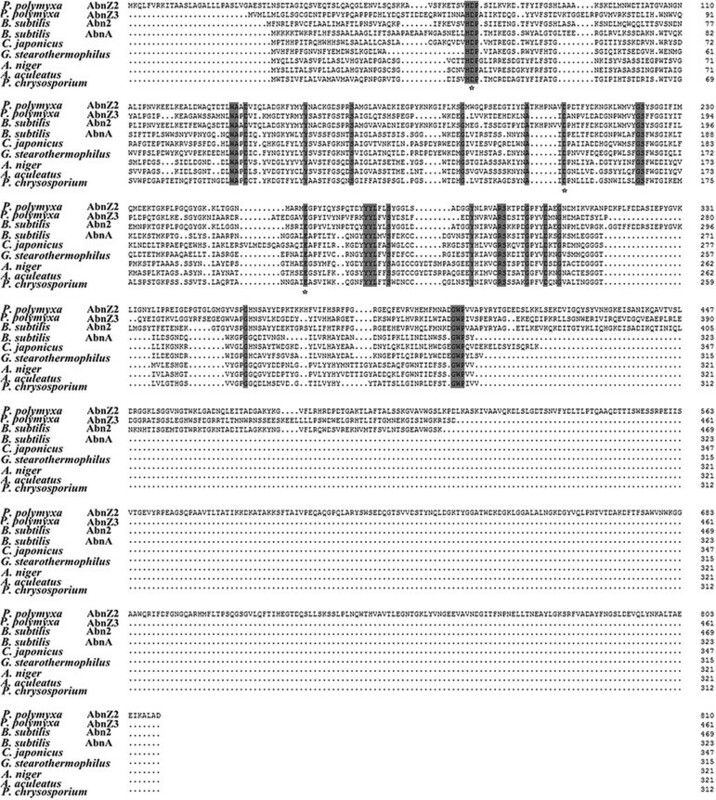 Such amino acid residues are Asp71, Asp205, and Glu258 conserved in the mature AbnZ2 and Asp49, Asp169, and Glu225 in AbnZ3 according to the result of multiple sequence alignment (Figure 3). Based on phylogenetic tree (Figure 4), we found that the endo-arabinanase AbnZ2 was cluster closer with the arabinanase from Bacillus subtills (P42293.2). And, endo-arabinanase AbnZ3 was cluster closer with the arabinanase from Caldanaerobius polysaccharolyticus (AHN16715.1). Moreover, arabinanase from bacteria was divergent from other fungal endo-arabinanase. 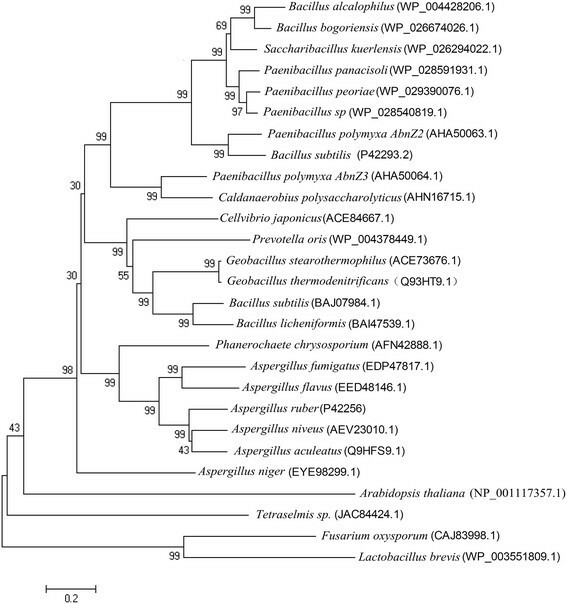 A phylogenetic tree showing relatedness and levels of homology between Paenibacillus polymyxa arabinanases sequence and other 25 arabinanases. Clustal X was used and drawn by using MEGA4. The effects of temperature and pH on the activity and stability of the purified recombinant protein were investigated. The optimal reaction temperature of purified AbnZ2 ranged from 30 to 35°C, while AbnZ3 had a wider optimal reaction temperature ranged from 20 to 35°C (Figure 5). Effect of temperature on enzyme activity. Reactions were conducted for 30 min in 100 mM pH 6.0 Na-acetate buffer. The highest activity was taken as 100%. Reaction substrate was 0.25% red debranched arabinan. Closed triangles and rhombuses represent AbnZ2 and AbnZ3. AbnZ3 displayed excellent cold-adapted properties when compared with reported cryophilic endo-arabinanases, like Abnc from P. chrysogenum 31B which was mostly active at 30 to 40°C and remained 55% of maximal activity at 10°C . The specific activity of AbnZ3 was about 48.7% of maximal activity at 5°C (Figure 5) and remained above 80% specific activity in a wide temperature range (15 to 40°C), which was unusual compared with reported arabinanases. Furthermore, AbnZ3 had a higher specific activity, 17.5 U/mg, than the reported cold-adapted endo-arabinanases, Abnc from P. chrysogenum with specific activity 6.5 U/mg. These results indicated that AbnZ3 was an excellent cold-adapted enzyme and had potential applications in different situations like juice industry, which need enzyme reacting in low temperature. 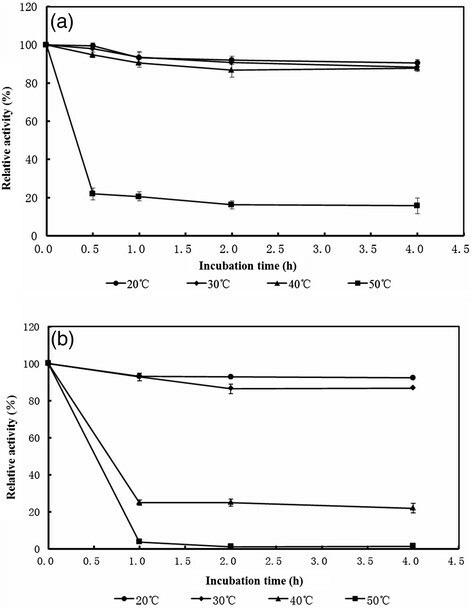 For temperature stability, AbnZ2 maintained most of the initial activity after incubation at 20 to 40°C for 4 h and remained 20% activity at 50°C for 4 h (Figure 6a). AbnZ3 maintained most of the initial activity after incubation at 20 and 30°C for 4 h while the enzyme losing most activity at 40 and 50°C after 30 min (Figure 6b). AbnZ2 had a better thermal stability than AbnZ3 that may be caused by the greater molecular mass of AbnZ2. Effect of temperature on enzyme stability. The enzyme was incubated at temperature ranged 20°C to 50°C in 100 mM pH 6.0 Na-acetate buffer for a period of time and residual activity was assayed in optimal temperature and pH by DNS method. Closed circles, rhombuses, triangles, and squares represent enzyme at 20°C, 30°C, 40°C, and 50°C. (a) Enzyme stability of AbnZ2. (b) Enzyme stability of AbnZ3. The optimal reaction pH of recombinant arabinanases was investigated under 30°C. The optimal pH of reported endo-arabinanases is mostly at 6.0 or greater, such as 6.0 to 7.0 for endo-arabinanase AbnS1 from P. chrysogenum, 6.0 for an endo-arabinanase from Bacillus licheniformis, 6.5 for that from Caldicellulorsiruptor saccharolyticus, and 7.0 for Abn2 from B. subtilis. Both AbnZ2 and AbnZ3 reached the highest activity when reaction pH was at 6.0 in 100 mM Na-acetate buffer (Figure 7). Besides, AbnZ2 performed higher relative activity than AbnZ3 in the pH 5.0 and 7.0. Effect of pH on enzyme activity. Activity was measured at 30°C for 30 min at the indicated pHs in 100 mM each buffer: Na-acetate (pH 4.0 to 6.0, closed rhombuses), Na-phosphate (pH 6.0 to 8.0, closed squares) and Tris-HCl (pH 8.0 to 9.0, closed triangles). The highest activity was taken as 100%. Reaction substrate was 0.25% red debranched arabinan. (a) Optimal reaction pH of AbnZ2. (b) Optimal reaction pH of AbnZ3. For pH stability, AbnZ2 was stable at pH 6.0 to 7.0. And, after incubation in pH 5.0 for 4 h, 20.81% of maximal activity was remained (Figure 8a). AbnZ3 was stable at pH 6.0 to 7.0 compared with 13.9% of maximal activity remained after 30-min incubation at pH 5.0 (Figure 8b). These results indicated AbnZ3 performed more poorly under the acidic condition than AbnZ2. Effect of pH on enzyme stability. The enzyme was incubated at 20°C in pH 5.0 to 7.0 100 mM buffers for a period of time. After that, residual activity was assayed in optimal temperature and pH by DNS method. Closed triangles squares and rhombuses represent AbnZ1 at pH 7.0 Na-phosphate, pH 6.0 Na-acetate, and pH 5.0 Na-acetate. The highest activity was taken as 100%. Reaction substrate was 0.25% red debranched arabinan (a) pH stability of AbnZ2. (b) pH stability of AbnZ3. Kinetic parameters towards the optimal substrate linear α-1,5-l-arabinan were measured at 30°C in 100 mM pH 6.0 Na-acetate buffer for 5 min incubation by the Lineweaver-Burk plot method. The K m and Vmax of AbnZ2 and AbnZ3 towards Linear arabinan were displayed in Table 2. The K m and kcat of endo-arabinanase from C. saccharolyticus were 18 mg/ml and 50 s−1, and the K m and k cat of endo-arabinanase from B. licheniformis were 19 mg/ml and 160 s−1. There is also endo-arabinanase with higher catalytic efficiency, such as Abn2 from B. Subtilis, of which the K m was 2.0 mg/ml . And, the endo-arabinanase AbnZ1 which we cloned from same strain has the K m and kcat as 11.6 mg/ml and 68.7 s−1. AbnZ2 and AbnZ3 had K m and kcat towards linear arabinan close to most reported endo-arabinanases, but did not perform better catalytic efficiency and substrate affinity than the best one. Specific activity was measured by purified recombinant arabinanase with linear arabinan at 30°C, pH 6.0. The data shown are the averages standard deviations of three independent experiments. Unlike α-l-arabinofuranosidases grouped into GH families 3, 10, 43, 51, 54, and 62 based on their amino acid sequence, all known endo-arabinanases are in GH family 43 . In this study, we cloned genes yxiA1 and yxiA3 from P, polymyxa Z6 and identified the function of corresponding proteins as endo-1,5-α-l-arabinanase by expressing the two genes in E. coli and testing the possible catalytic activity on the specific substances for major enzymes of GH43 family. The two genes were then renamed as abnZ2 (yxiA1) and abnZ3 (yxiA3). After purification, we found an excellent cold-adapted endo-1,5-α-l-arabinanase AbnZ3 (YxiA3), which although did not showed higher catalytic efficiency than the reported endo-arabinanases, would be specially attractive in both juice clarification under the low processing temperature to hamper spoilage and avoid changes in nutritional properties and enzymatic extraction of pectin. Besides, there has been increasing interest in arabinanolytic enzymes because l-arabinose is the second most abundant pentose in nature and is considered to be a renewable carbon and energy source . The finding of new endo-arabinanases with different properties should expand to the utilization of arabinooligosaccharides from industrial by-products in food industry. This work supported by National Special Fund for State Key Laboratory of Bioreactor Engineering (2060204), partially supported by National Natural Science Foundation of China (No. 31201296) and ‘the Fundamental Research Funds for the Central Universities,’ People’s Republic of China. SW carried out the molecular cloning studies, participated in the determination of enzymes' biochemical properties, and drafted the manuscript. YY carried out the analysis of the enzymatic products. JZ screened and identified the strain P. polymyxa Z6 and participated in sequence alignment. JS participated in the determination of enzymes' biochemical properties. JX participated in the design of the study, performed the statistical analysis, and revised the manuscript. SM and DW conceived of the study and participated in its design and coordination. All authors read and approved the final manuscript.